Your household income is at or below the requirements shown in the chart to the right. You reside in Franklin County. You are a Columbia Gas of Ohio customer. You are a PIPP Plus or HEAP customer. 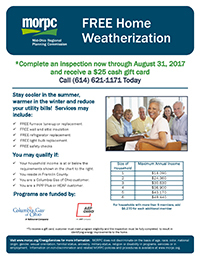 *To receive a gift card, customer must meet program eligibility and the inspection must be fully completed to result in identifying energy improvements to the home.